Participants stand with signs in Newton's green. Photo by Jennifer Jean Miller. NEWTON, NJ – The Sussex County Freeholders voted unanimously on Wed., Sept. 9, to ask the state and federal governments to investigate Planned Parenthood, for allegedly participating in illegal activities, in the reported sale of body parts of unborn and aborted fetuses. Senate bill S3150 from Joseph Pennacchio will ban any financial compensation for donation of tissues from fetal cadavers, for the purpose of research. An assembly bill is in the process of being drafted. Though the topic has been in the light for many years about the sale of body parts from abortions, more recently, hidden cameras have caught Planned Parenthood employees discussing the sale of fetal body parts, which is against federal laws. An undercover video in a restaurant captured Dr. Deborah Nucatola, Planned Parenthood’s Senior Director of Medical Services, discussing the sale of the body parts from these babies as she lunched. This video footage is featured below. Viewer discretion is advised. Nucatola discussed casually and almost in awe, how those in the research industry, as she stabbed her salad with her fork, were seeking hearts, lungs, and intact livers, exhaling a “wow” as she did. Under federal code, the sale of human body parts is considered a felony, as well as the trafficking of aborted baby body parts, which can carry prison time of up to 10 years and/or a $500,000 fine. An order form was in existence, however, allowing fetal or cadaver, the type of tissue, the gestational range of the aborted baby, and more. It was in 2014 that investigators acted as those representing fetal tissue procurement interests with Nucatola in a restaurant. Nucatola was the director in the New York Planned Parenthood at 434 West 33rd Street. Nucatola, in addition to discussing her involvement in Planned Parenthood’s trafficking of aborted fetuses, performed abortions too. “They just want to do it in a way that is not perceived as ‘this clinic is selling tissue, this clinic is making money off of this,’” stated Nucatola, as she contributed that patients wished to have tissues donated. In the video, Nucatola brokered the sale, for $30 to $100 “per specimen,” while Nucatola discussed as how those like herself when they are performing abortions are “cognizant of where you put your graspers,” ensuring to go below the baby’s thorax, so as not to crush the child’s heart, lungs and liver. Nucatola also told the buyer that by switching the fetus around to breech, or foot first birth, the “calvarium,” or the baby’s head, would remain intact. They do so with ultrasound during the abortion procedure. The abortionist then grasps the baby’s legs with forceps through the birth canal, creates a small hole in their skull, and then removes the child’s brain with a catheter. Experts state that this practice Nucatela described in the video mirrors what is considered an illegal partial-birth abortion. Partial-birth abortions are also federally prohibited and can carry a prison sentence of up to two years, and/or a monetary penalty of up to $250,000. It is considered a homicide, and against federal code, when a child is born alive and intact during an abortion. However, in spite of the partial-birth abortion being considered unlawful, Nucatola justified on hidden camera that the law can be interpreted. She said that it “doesn’t matter” if she did not intend death to the baby. Nucatola further explained that she knew what those who were seeking tissue were looking for. And she explored the list of her cases that day to see what she could cull from them. She said that patients could typically be talked into donating their fetuses when approached a particular way. She also explained about the channels that one must go through to acquire the tissue through Planned Parenthood, in order for Planned Parenthood to avoid litigation and scrutiny, as dictated by its legal office. Later, the undercover agents posing as fetal tissue acquisition professionals, met with Planned Parenthood’s President and CEO, Cecile Richards, thanking her for the time with Nucatola. Freeholder Gail Phoebus has been one of the most vocal of the freeholders on opening an investigation against Planned Parenthood. 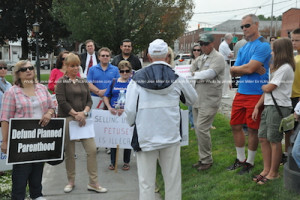 She penned a letter to Freeholder Director Phil Crabb, and her fellow freeholders. The national news media has reported on the horrible scandal involving the leadership of the Planned Parenthood Federation of America and its affiliates, and how they have allowed human body parts to be harvested and sold at their clinics. Attorneys who have viewed the several videos on which Planned Parenthood officials have discussed this have raised the possibility that federal laws have been broken. I would like to ask the Board of Chosen Freeholders of Sussex County to prepare a resolution for our next meeting, if approved, to be sent to the Freeholder Boards of the twenty other counties, both Chambers of the Legislature, and the Governor’s office — that calls on the administration to investigate all Planned Parenthood facilities in New Jersey to make sure they are not violating any State or federal law. In addition, to call upon our legislature and Governor to pass legislation to close any loophole in State law that may allow this to occur in New Jersey. 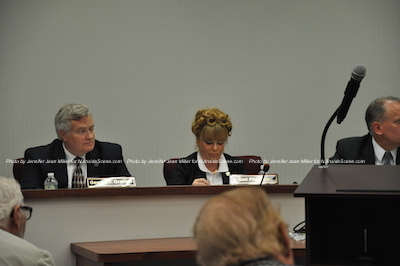 Following a two-hour public session, with the room at standing room only capacity, there were several members of the public who were outspoken against the measure. Green Party Assembly Candidate Kenneth Collins, as well as Democratic Assembly Candidates Jacqueline Stapel and Michael Grace, countered that this was a “conservative” and “right-wing” measure as a result of a sting operation that does not impact New Jersey. They also considered it a waste of taxpayer funds. 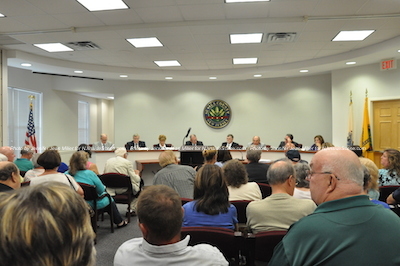 The audience that packed the freeholder meeting to discuss Planned Parenthood. Photo by Jennifer Jean Miller. Triste Brooks from Newton’s Planned Parenthood contributed that their facility, nor any others in New Jersey, participate in tissue donations. Gail Phoebus at the freeholder meeting. Photo by Jennifer Jean Miller. Online, some Democrats also debated the idea, suggesting a hands-off approach from county legislators in suggesting an investigation. Some, however, questioned Planned Parenthood, and the allocating of funds to what they consider is Planned Parenthood propaganda, suggesting more due diligence be initiated with the organization, before funds are handed over. One person among the chatter in one of the Democratic groups stated that under Obamacare, the services Planned Parenthood offers are obsolete, and women can reap these services from a doctor’s office now through their insurance. The resolution that Phoebus proposed, she stated, would back the state measures to prevent fetal body parts from being sold. Governor Chris Christie has plans to defund Planned Parenthood should he reach the White House. Other candidates running for the Republican seat stated that they defunded the organization in their state. At the same time, New Jersey and other states with candidates who stated the same, still have Planned Parenthood facilities within their borders. Christie’s reasons for defunding have included that it was unbudgeted for, or that the organization was duplicating services, and the funding was not needed. He has defunded Planned Parenthood each year for six years. At the federal level, however, Reuters reported in an August article that a Reuters/Ipsos poll showed citizens in favor of Planned Parenthood funding, due to the healthcare services it provides, even free for some women. Planned Parenthood, in spite of the videos, has stated that three percent of its services entail abortions. Republicans rose up against the $500 million in funding after learning of the videos, which was a measure that failed due to Democratic support. The rest of the Reuters/Ipsos results? There were 54 in favor of federal dollars to Planned Parenthood, with 26 not. But, 44 percent of those who watched the videos, changed their stance, viewing Planned Parenthood services as negative. 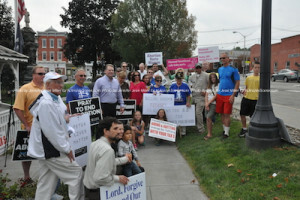 On Saturday, Sept. 12, locals against the principles of Planned Parenthood formed in Newton’s square for a rally. 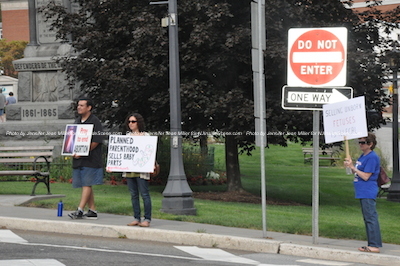 They toted signs that were pro-life focused, calling for the defunding of Planned Parenthood. David Larsen, who is running for Congress for District 7, was one of the speakers. Michael J. Cino, who is running for Congress in District 5, was also present. Assemblyman Parker Space (R-24) and Phoebus, who is also vying for the Assembly Seat being vacated by Alison Littell McHose, were both in attendance at the rally. David Larsen, Candidate for the Dist. 7 Congressional Seat, holds up a sign at the rally. Photo by Jennifer Jean Miller. “What I’ve been doing here has been on my heart since I was a kid,” said Larsen. He said he could not understand what part of life those at Planned Parenthood do not understand. 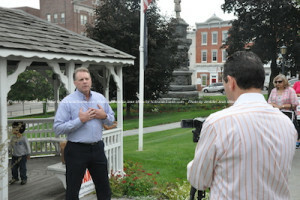 David Larsen speaking at the rally. Photo by Jennifer Jean Miller. He explained that Margaret Sanger, the founder of Planned Parenthood, was a racist, who advocated genocide, specifically for the African-American and Latino communities. He said that Sanger viewed these particular ethnic groups like weeds to be destroyed. Attendees listen to some remarks at the rally. Photo by Jennifer Jean Miller. “The womb is the most dangerous place in the world,” Larsen continued. He said that in the United States alone, more than 1.5 million of the unborn are taken from abortion, which equates to about 4,000 children daily, with 2,000 of those children classified in the African-American and Latino ethnic groups. Larsen said that is why Planned Parenthoods are placed in areas where a strong African-American and Latino demographic exists, in order to align with Sanger’s founding priniciples for starting her birth control clinic, that later turned into Planned Parenthood. He described that in old traditions, some would sacrifice their children at the altar, and that the same is happening with abortions, though generations are being killed on the inside of their mothers’ wombs. “Congress needs to call an investigation into every Planned Parenthood and abortion clinic in the state,” Larsen added. 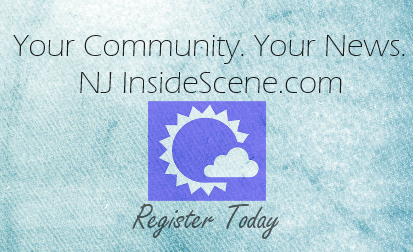 Cino told NJInsideScene.com that he feels as the issues with Planned Parenthood are being explored, that the facilities should be shut down as the issue is pending. Though Space and Phoebus did not speak at the rally, they furnished remarks later via email. 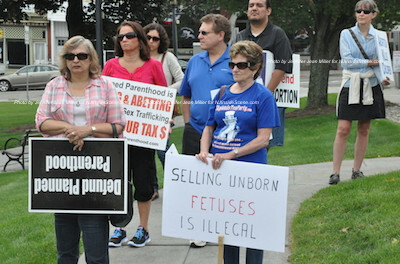 Attendees pose with their signs at the rally. Photo by Jennifer Jean Miller. 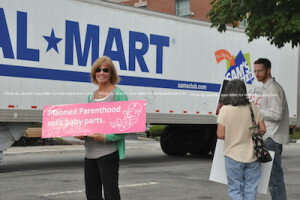 She said, however, that Planned Parenthood is indifferent to human life. “To listen to these videos and hear those Planned Parenthood officials discuss the quote unquote ‘harvesting’ of babies’ hearts and lungs – all the while stuffing lunch into their mouths – is disgusting,” Phoebus vented. Phoebus said that Planned Parenthood spends millions for lobbyists, and its top brass are paid handsomely through millions it receives back from the government. Whistleblowers who worked with them captured Planned Parenthood executives bragging about their practices, including the trafficking of baby body parts. Lisa Hart of St. Patrick’s Church of Chatham at the rally. Photo by Jennifer Jean Miller. The resolution, Phoebus stated, would call for a review of Planned Parenthood, asking that of the New Jersey Legislature and Congress. Plus in New Jersey, asking that New Jersey demand from Planned Parenthood that no taxpayer funds are being utilized to support or defend their actions in this matter. 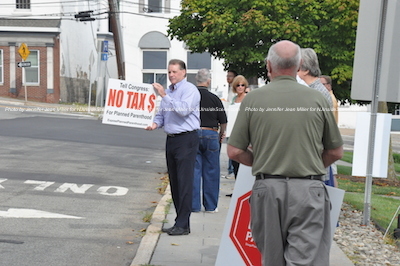 Additionally, the freeholders, Phoebus said, support that all loopholes are closed in the bill that Joseph Pennacchio started, and that Senator Steve Oroho (R-24) be added as a co-sponsor when the bill is formally introduced. Rally attendees face cars on Main Street with their signs. Photo by Jennifer Jean Miller.